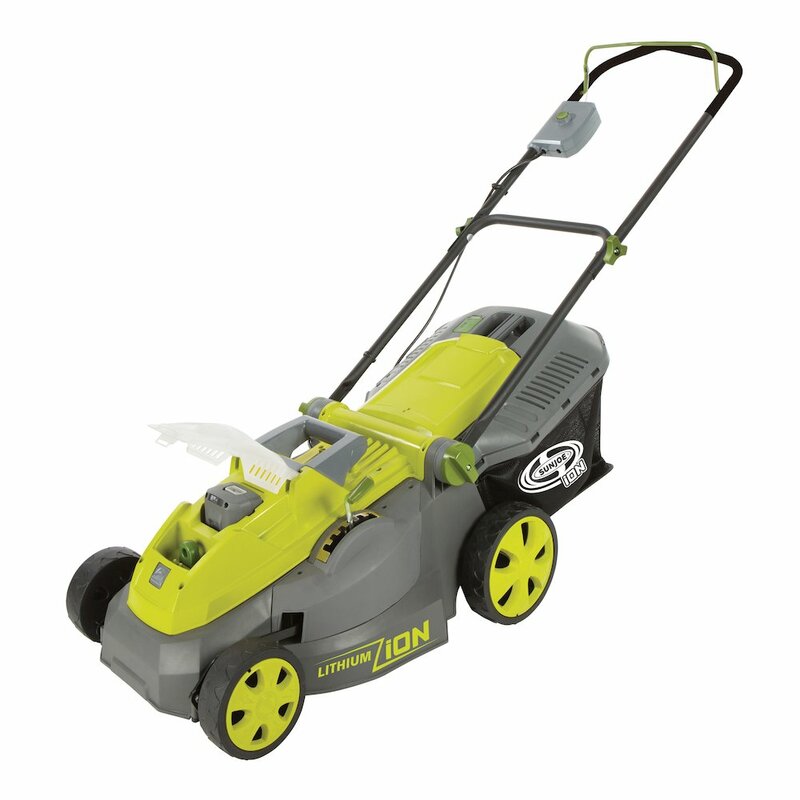 Conveniently, this lawn mower is another great eco-friendly option because you don’t have pull cords, carbon emissions, and there is no risk to running over any cords or getting tangled while mowing. Their compact design is perfect for your smaller to mid-size yards making it a top choice. 6 position height adjustment lever tailors grass cutting height options from as low as 1.18 inch to 3.15 inches. Sun Joe proudly offers a full two-year warranty and is Energy Star certified, so not only are you guaranteed a quality product, but you are also being guaranteed to save money over the long term in charging your battery. This mower is simple to set up and use. Plug in the battery and the safety key, and you are ready to cut. 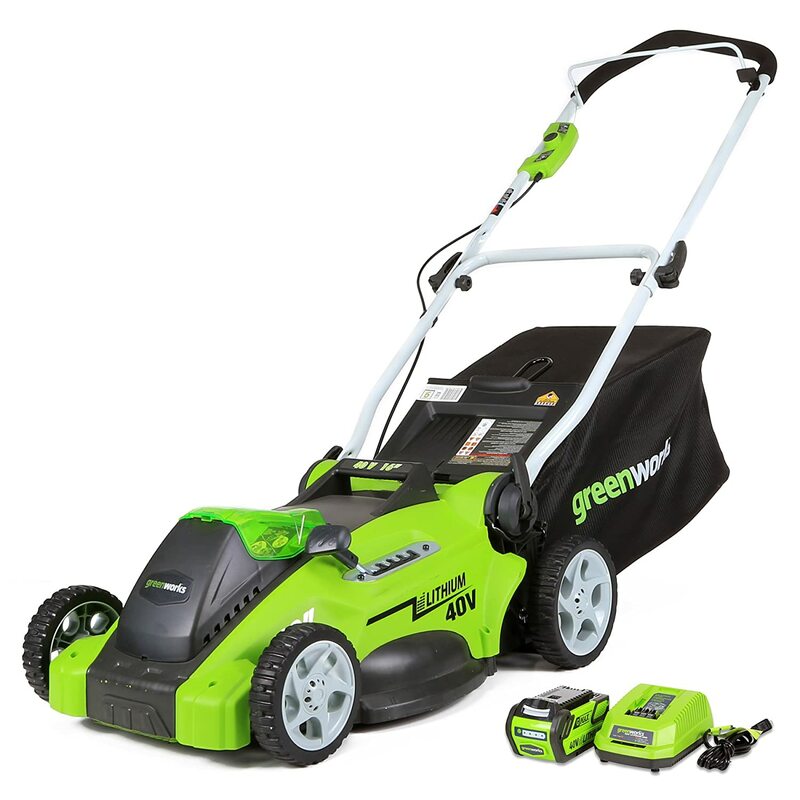 With just an overnight charge of the battery, this lawn mower is ready to power through your lawn with a simple press of a button and a squeeze of the start bar. This mower is known for the spinning power of the blades and with it being considerably quieter than a gas mower, you will have no problems with noise pollution. Being lightweight, the Sun Joe iON16LM is easy to push and you don’t have to worry about walking at a fast pace. The cut is even and you don’t have to worry about missed sections. So, if you have a lawn smaller than 5,000 square feet, this may be the mower for you. If you are concerned that you will get low quality with low cost, this is not that product. For under 300 dollars, you are getting more than you would imagine. Its quiet power is admirable, and the battery charge on it is strong. The battery lasts through your cutting job, and when depleted, it charges quickly with a charge time of about 2.5-3 hours. The multiple safety features are also great. It has a safety release on the handle and in order to start it, you have to press the start button and pull the handle. This lawn mower has no problem cutting down tall grass and cuts evenly. With its lightweight durability, it negates any need for self-propulsion. 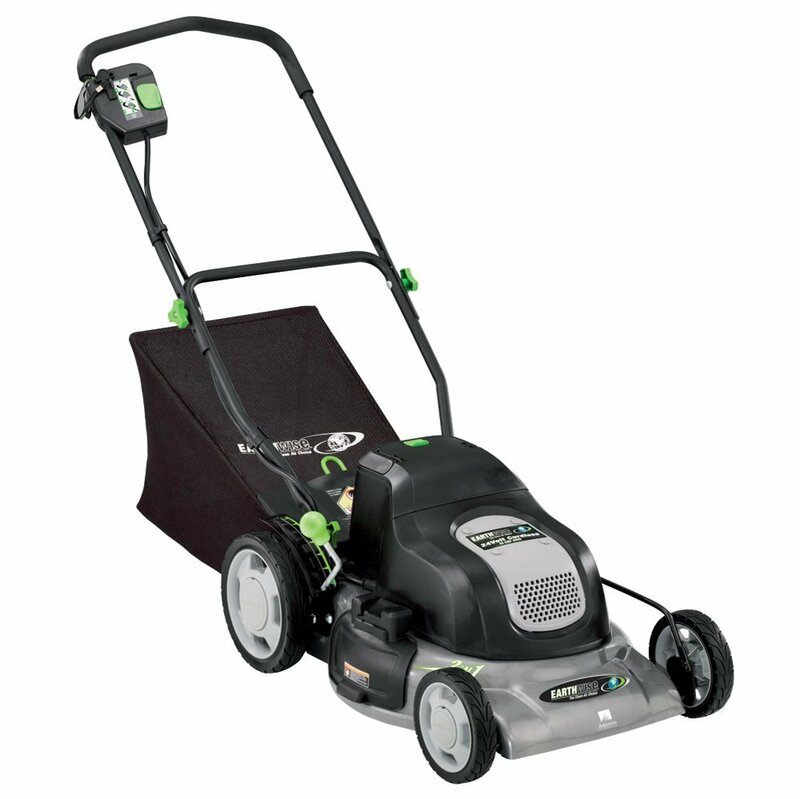 Overall, for this category, this mower was extremely hard to beat in quality and durability. Like all electrical mowers, this one is also eco-friendly. However, it must be noted that the packaging this lawn mower comes in, is all cardboard so the materials this company uses is all recyclable. It also makes for easy removal of your product, so there is no fuss when you receive it fresh out of the box. This makes for an easy, convenient experience right from the moment you receive it. The packaging and ease of assembly is impressive compared to other comparable lawn mowers. If you are looking for a complete environmentally option, Sun Joe seems to be top rated in this category. This mower has a rugged design that can’t be ignored. The Earthwise Cordless Electric Lawn Mower, Model 60120 gets this review based on its features. It has a single lever height control option with an easy on and off the mulching plug, grass catcher, and discharge chute. It comes with a handle mounted safety blade control and safety key. The comfort “V” handle is equipped with a cushion grip and has a soft touch operation making your grass cutting experience painless, and efficient. It also comes with the battery and charger, so for the price, it’s a steal. You don’t want to overlook this mower. GreenWorks is a lawn and garden brand that is known for providing top quality equipment to make your lawn look it’s best almost effortlessly. They pride themselves on being green and reducing your carbon footprint. This mower has a 40V 2 Ah Lithium-Ion battery system that powers multiple tools make it part of a complete yard work system. The single level 5-position height adjustment offers a wide cutting range for the best cut in all environments. The 2-in-1 rear bagging and mulching features offer the capability to work efficiently and quickly with multiple uses. This mower is a great option for less than 300 dollars. The WORX brand is known for being eco-friendly. This particular mower cuts up to 6,000 square feet on a single charge and weighs just under 33 pounds making it the perfect manageable mower. It also has a 3-in-1 feature for mulching, rear-discharging, and bagging capability. The removable battery is convenient for charging separately from the mower. It has an easy start switch that makes it easy to operate. It’s quiet, easy to use in the damp grass, and dependable while making an even cut through your grass. 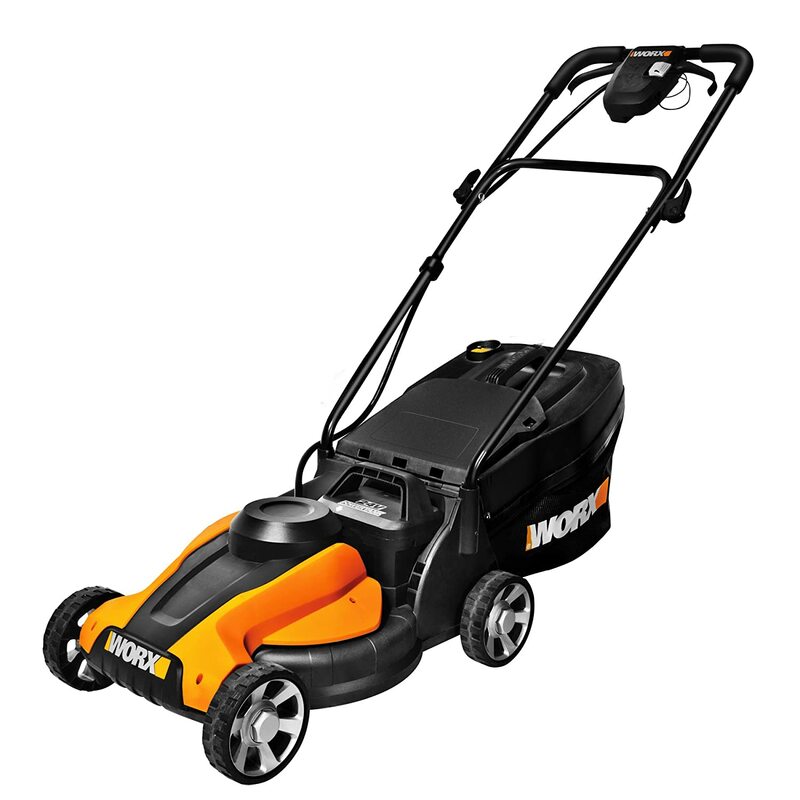 WORX products are always affordable, and never disappointing. You will be happy to use this mower.